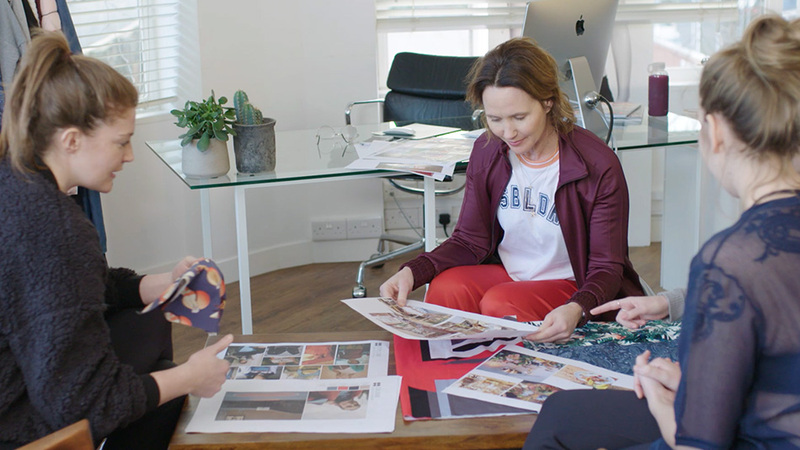 Twice a year, our Founder and Creative Director Tamara takes our design team to a global location that has inspired her. For Spring Summer, it's Barcelona. Here she gives you the lowdown. The new collection began after an amazing design trip to Barcelona, a city that I really love because of its amazing culture. Our design trips are the best part of my job. They're so much fun and I particularly love going abroad as I feel it really awakens the senses. We act like proper tourists and walk for miles, people watching, trying all the local workouts and eating local food. This time, we particularly focused on the architecture, especially Gaudi’s Sagrada Familia and Ricardo Bofill’s Walden 7. We loved the juxtaposition of these two buildings, built in such different eras. We saw Sagrada Familia on our second day in the city. It’s a huge gothic structure that's just unbelievable. We designed our own Gaudi walking tour and despite the gothic exterior, the interior completely blew me away. Drawing from Gaudi’s fascination with nature and its geometric forms, I loved how he broke up this limitless space with soft, detailed structures, using vines and branches as panels throughout the church. We wanted to look at some quite different architecture, so travelled outside of Barcelona to visit the Walden 7. Inspired by BF Skinner’s sci-fi novel Walden 2, this was built on the refurbished ruins of an old cement factory in the 1970s. It's a huge monolithic terracotta building surrounded by beautiful tiles and nature. Back in London, we took the feeling of surrealism from Gaudi alongside Ricardo Bofill's idea of trying to create a utopian community. This often turns to dystopia, so we started to get the feeling that something wasn't quite right. We liked the idea of perfectly imperfect pieces and have created some amazing surreal prints and unexpected designs. Our more obvious inspiration for summer has to be the 1970s era. Inspired by Barcelona's incredible vintage scene. we've bought some incredible prints from the archives, created some retro bikini shapes and a new saturated colour palette. We're continuing this season with our Bum-Sculpting Leggings and as it's our 20th anniversary this year, we've had some fun with the Union Jack print. We've taken a pair of our Power Leggings and added a union jack print from the archives, which I just love. We've also added the SB LDN logo on quite a lot of our products, which is a fun way to celebrate 20 years. We always try and be a bit fun and humorous with some of our prints. We still have plenty more serious, athletic designs, but I'm loving some of our fun 70s-inspired prints. My favourite is the 'Gymball Print', which has a girl lying back blowing bubble-gum, which is really fun for summer. I'm also really loving our tropical print, which for the first time ever we'll be doing in teen sizes, so we can get our younger customers into our leggings as well. Keep your eyes peeled in May! I absolutely love our swimwear collection this season, we've created a capsule collection of our favourite classic pieces alongside some fun new styles. My favourite is the reversible bikini, which is based on a style we picked up in a vintage store in Barcelona, but updated in our really technical fabric. I hope with this collection we inspire you to get moving and get active, but also to really style it up so that you can wear it from studio to street. I think there are some amazing pieces in there that will inspire you to workout when you're on holiday and inspire you to be active wherever you are, whatever the weather. It's time to get back on it, shop our new arrivals today.